The new 4YF 2.4GHz MODE 2 radio system makes Futaba quality FHSS (Frequency Hopping Spread Spectrum) technology even more accessible. • Sport 2.4GHz FHSS System. THIS IS A MODE 2 TRANSMITTER [THROTTLE ON LEFT STICK]. BUY FROM THE EXPERTS OVER 75 YEARS IN THE TRADE! The R334SB-E was produced by Futaba specifically for electric RC cars. The compact form, built-in aerial and short external aerial allow it to be tucked away under a body shell for a clean and professional installation without any sacrifice to the performance. Supplied with Futaba R136F 6 channel receiver. The R334SBS is a high response speed ground based receiver using Futaba's ultra-fast T-FHSS SR system. It is compatible with 3.7V to 7.4V power sources allowing a wide array of applications. Uses the ultra-fast T-FHSS SR system. This is the Futaba R6004FF 2.4GHz FASST 4-Channel Micro Receiver. Easy one touch linking to transmitter. Designed for short range application such as indoor aircraft only. F/S and Battery F/S function (for channel three). 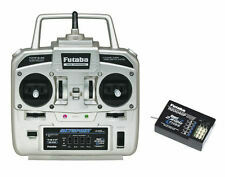 Futaba 4PV transmitter 4-channel # Combo ( 2.4 GHz / R304SB). Modell 4PV. Futaba T4PV - With the Futaba T4PV, the starter T3PV a big brother is set aside. Marke Futaba. To optimally tune the model, the T4PV has a total of 8 mixers. This has the micro servo connectors (apart from channel 3 for the ESC). It weighs: 7.5g. This is the Futaba 4PV T-FHSS SFHSS 4-Channel Computer Surface Radio System. Item #:FUTK4700. MPN FUTK4700. Type Receiver & Transmitter Set. Transmitter, Receiver, Mini Screwdriver and Instruction Manual. R304SB Receiver. The sensitivity of Futaba car rate gyros can be adjusted from the T4GRS. RADIO / RECEIVER / SERVOS. Radio Systems. Pull Starter. -T4GRS Transmitter. TRANSMITTER SPECS. TRANSMITTER FREQUENCY. This has the micro servo connectors (apart from channel 3 for the ESC). Futaba R204GF-E-S-FHSS 2.4GHz Four Channel HV Micro Receiver. Compatible with any Futaba S-FHSS/FHSS system. RADIO / RECEIVER / SERVOS. Pull Starter. Radio Systems. R204GF-E-S-FHSS 2.4GHz Four Channel HV Micro Receiver. Up for sale is a Hitec 4 Channel receiver. Model: HFS-04MG 35MHz, FM Tested and fully working! Very good, used condition. It looks like there has been a small repair to the aerial wire at some point. (Please see photos). This still works perfectly. Suitable for many radio controlled brands, like Tamiya, Acoms, Futaba, Sanwa, HPI, Traxxas, Kyosho etc... Sold as seen. Any questions please ask. Postage to the UK is free. I also post overseas. Check out my other items for sale for more vintage and modern radio controlled parts! Thanks for looking. Up for sale is a Hitec 4 Channel receiver. 35MHz, FM Tested and fully working! Good, used condition. Suitable for many radio controlled brands, like Tamiya, Acoms, Futaba, Sanwa etc... Sold as seen. Any questions please ask. Postage to the UK is free. I also post overseas. Check out my other items for sale for more vintage and modern radio controlled parts! Thanks for looking.